Their baby girl is here. Their family is now four. 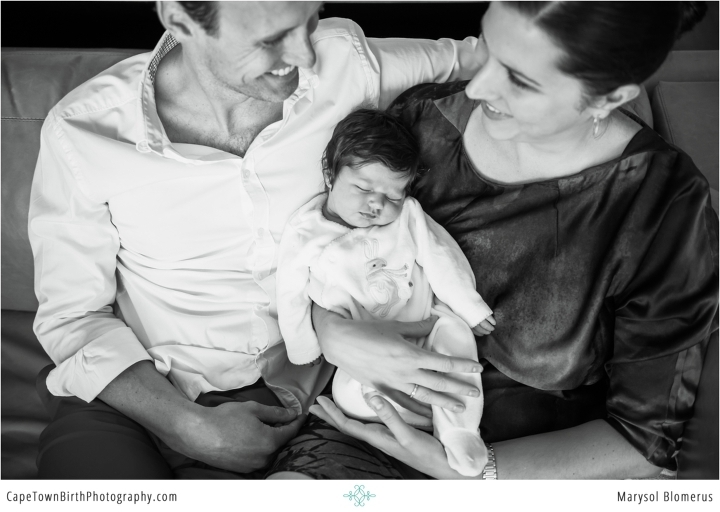 I met back up with Tiphaine and her family, this time at home (because newborn sessions are awesome at home). Your space is more incredible and personal for intimate photos than you can see. Her parents were in town so of course they are included. I’m all about the family affair! We even incorporated the dogs… but that was a bit of a crazy haired moment. Be sure to see their Tokai Forrest maternity session right here if you missed it. Welcome to the world sweet Allegra who slept her way through most of this session. I still can’t stop thinking about all-that-hair she was born with. Its magic! Newborn sessions like these include your classic portraits that you might really want to frame and gift to family. But also are lifestyle in focus, getting all the unscripted moments in between and angles that are flattering but not as rigidly posed. You won’t see a baby in an unnatural position in a pot (awesome as that style is, it’s not mine). But you will see all her tiny details and portraits of her natural brand new beauty. Newborn sessions come in a package with a maternity session and a jaw dropping luxury album. Because I believe in printing images and holding them in your hands. Inquire here for more information. When I met Gwen, we clicked instantly. I understood her story and where she was coming from. It resonated with me. She’s wanting to share it a year later because it will probably resonate with some of you. If you missed it, start with their beautiful maternity session then come back to work your way through her story. She’s sharing it in her own words. Their images are raw, poignant, and honest. For a little while there, we weren’t sure if an emergency c-section was needed. But Gwen had her instinct and had assembled a great team around her. You can feel the emotions of this dad (oh-how-fond-I-am of this dad, he makes me choke up with emotion) from trying to get her out the door to not knowing how this birth would turn out to meeting his baby and being surprised it was a boy to the tears. Proving real men do cry. He is a picture of a father fully present and invested in this birth. It was my honour to work with them as a couple and their tender family. Gwen was assisted by the following team: Angela Wakeford from Birth Options Midwifery Team, Dr. Douglas Dumbrill at Life Vincent Pallotti and Doula Charlene Yared West. My gratitude to them for allowing me to work as another professional on the team. Without futher ado, their story. As always, shared with family permission. It takes so much planning, mental energy, tender love, and care to create a home. So many little decisions that no one but you knows about. So many mementos or spaces that are sacred. 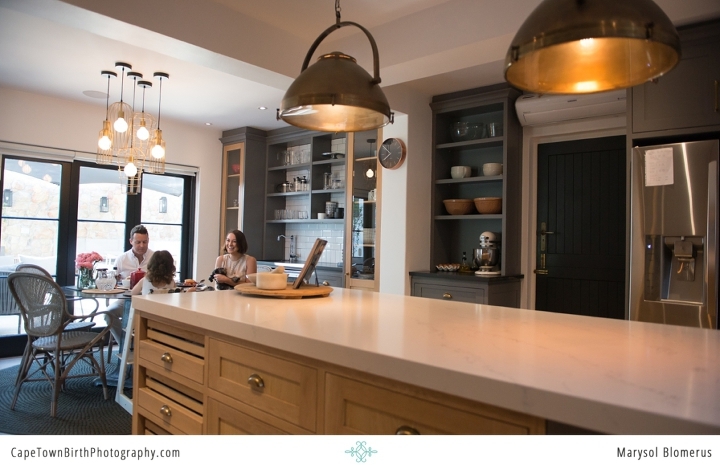 Ways we enjoy those spaces and create memories as a family is so unique to the seasons we are in. I love at home sessions because it’s your space. There is no other location more intimate or personal as a backdrop for remembering what your family was like in this season. I can help you choose which room is right for light. We can head outside as well for variety. We can set up some “prompts” as we first talk about what are some of the ways you normally hang out or play together. Some families bake together. Some do legos. Some wrestle on the floor and then read books. Either way, we’ll setup some things for you guys to “do” together. And then I capture all the moments in between that you don’t see or appreciate fully until its imagery that’s artistry. I also work to get some more “frameable portraits” so it’s a well-rounded session. Family sessions are exclusively offered to my existing clients only. So if you have (or one day plan to) hired me for your maternity/newborn sessions or birth coverage, I am available onwards to capture your family as it grows. I offer this exclusively to clients because of my limited availability and not the general public because I believe in the chemistry and trust required to get these images. It’s how I roll best. If you would like one of your own, contact me for booking information. I’ve been photographing Nikki’s family since Harper-Rose was in utero. It’s amazing how beautifully she’s grown and is used to me photographing her now. Their lives have changed as each season requires. Gone is the babyhood and now their home is full of play and dress up and cooking and painting together. They wanted to remember this season, at this age with her. Hugs in the kitchen, getting dressed and swims in the pool. Because it’s all so beautiful and fleeting…. Enjoy their beautiful session one Saturday morning as they welcome me in to document their lives at home. Today,I want to spotlight one of my personal favorites (I’m biased, admittedly). Glynnis Garrod from Birth Options Midwifery Team. Full disclaimer, Glynnis was MY midwife for my first birth. I will never forget how close she stayed. I hung my head down in pain and found that absently turning her ring kept me focused during contractions. That’s what I marvel about with midwifery care. I respect the role of a doctor (and needed one) but they can not possibly give the kind of intensive-at-your-side-care that midwives can give. Its a huge time commitment. Midwife means “with woman”. That’s exactly what they do, they stay near you if you need that kind of support. Or they hang back when you need space, available when called. Its a really beautiful thing to observe as a person attending a birth. Here are some images of Glynnis in action. I credit her with saving my eldest daughter’s life. She paid attention and caught the signs something was dangerously wrong and so gently informed me while giving me my options. Being “with woman”, physically at my side for hours was what enabled her see what was happening. We called in obstetric support and a doctor performed a necessary c-section. Together they both worked harmoniously in their specialties. Here’s my Q & A with her. I hope it helps in your research. 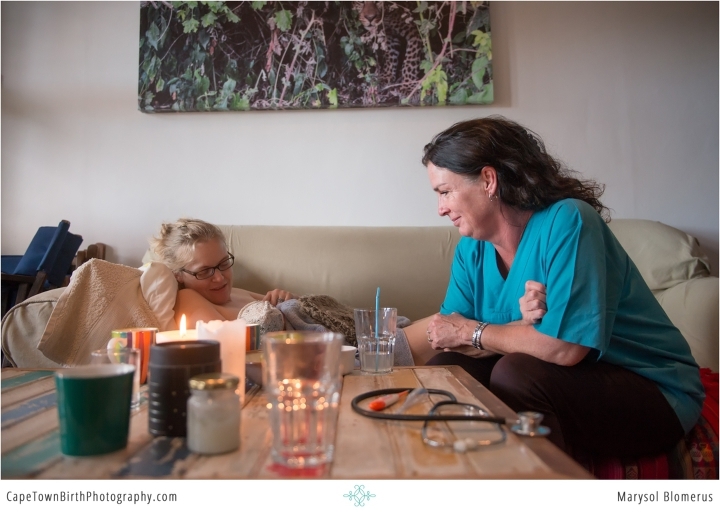 1) HOW LONG HAVE YOU BEEN A MIDWIFE? I qualified in 1990 and starting working in the labour ward at Groote Schuur, so 27 yrs. I’m due 22 May, so far I am wanting to go to Origin Maternity Hospital and I live in Table View. Though I am nervous now as I want a VBAC very badly but Origin is seeing me as higher risk and I do not want to be bullied in to another cesarean. This is my 3rd baby. 1st was normal birth with a midwife 2nd was cesarean. I am urgently looking for a Midwife close to Table View. Please can you let me know if you can asist or inform me of someone who can? Thank you for your comment and congratulations on your pregnancy! How wonderful! I suggest you visit the Cape Midwives website or contact Birth Options directly to discuss your options. I hope that helps! All the best for a beautiful, safe birth.